We are now at our new location, just off Hart St., next to Kohls. Our new address is 1270 S. Hart St. Rd., Vincennes, IN 47591. 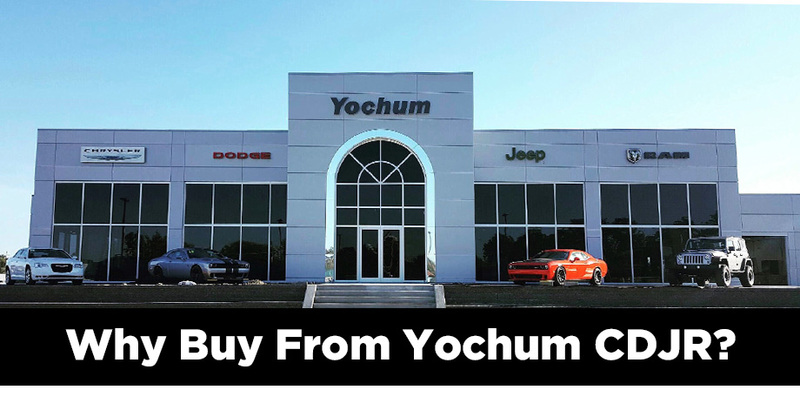 Yochum Chrysler Dodge Jeep Ram Fiat is an established Vincennes, IN dealership, located just off Hart Street, next to Kohls, that maintains a well stocked supply of Chrysler, Dodge, Jeep, Ram, and Fiat vehicles in our new and pre-owned inventories. We were formerly known as Westport Chrysler Dodge Jeep Ram. We have been a family owned and operated dealership for over 55 years serving Knox and Lawrence County! It was started just across the Memorial Bridge from downtown Vincennes by Robert Mallory in 1961. After retiring in 1984, Paul Yochum and Adrienne (Mallory) Yochum became second generation owners. In 2008, Westport encountered a flood, leaving the dealership 7 feet under water. After that, we repaired our building at our old location, only to be flooded again in 2011. We then re-located to the old K-Mart location that has served us while we were getting our building plans put together. Now alongside with Paul and Adrienne, their son, John Yochum, are close to their new building being complete just off of Hart Street, next to Kohls. Along with our new building, we have changed our name to Yochum Chrysler Dodge Jeep Ram Fiat. We will now have a state of the art facility to better serve our customers and community in their automotive needs! This city has been so supportive of us in the past few years getting everything in order; we are excited to have a permanent location in Vincennes!